Why Does Athlete’s Foot Live in Shoes? Athlete’s foot is caused by dermatophyte fungus (the same type responsible for jock itch and ringworm), whereas plantar warts are caused by human papillomavirus. Yet, both types of fungi prefer to live on moist shower floors and inside footwear, which provides a nice, soft, organic surface for the colony. Besides, let’s face it: the foot is a sweaty, sticky appendage. With 250,000 sweat glands per foot, who could blame them? Fungi loves feasting on the sweat produced by our feet and the colony really thrives inside a shoe that has been enclosed in a brown cardboard box. Who Should Worry about Catching Athlete’s Foot from New Shoes? There are some people who may need to take extra care to protect themselves from athlete’s foot fungus and plantar wart transmission from shoes, North Carolina podiatrist Jane E. Andersen DPM told the Huffington Post. “Older people, for instance, may not be able to fight off infections as well as younger people. The same goes for people who are immunocompromised, whether it be because of a medical condition (such as diabetes), or otherwise,” she said. People who have had these infections in the past are also more susceptible to pick it up again. Bring your own ped socks to try on shoes with less fear of fungus. How Can Shoe Shoppers Protect Themselves? – Bring your own socks or at the very least use the disposable pantyhose all shoe stores are required to provide. – Soak your feet in Epsom salts when you get home. – Spray all new shoes with an antifungal mist. – Be aware that shoes ordered online have an incredibly high return rate, so zap them with a UV shoe sanitizer before putting them on your feet. An investment in the SteriShoe UV shoe sanitizer can give you some peace of mind that your shoes are free of pathogens. 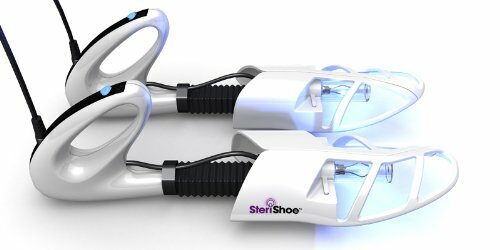 SteriShoe: The Only UV Shoe Sanitizer You Need to Know About! SteriShoe was featured on the ABC News segment because it is the only clinically-proven, podiatrist-recommended ultraviolet shoe sanitizer. You may see other brands besides the original offered by Shoe Care Innovations, but they were fast-tracked through the FDA’s 510(k) clearance program. We have a substantial body of research (published in respected medical journals) to back the claim that our UV device kills up to 99.9% of bacteria, fungi, and viruses with one 45-minute cycle. Ultraviolet light even kills pathogens like MRSA, Staph, and the fungi that causes toenail fungus. You can review our research here. We recommend using the UV shoe sanitizer before you wear new pairs of shoes. Repeating the cycle each day will cover all bases and ensure that your feet do not unnecessarily come into contact with dangerous microbes. This product is a “must” for diabetics and people who have had prior foot infections. Try it 30-days risk-free here.